The African buffalo has unfortunately of very sad reputation of being the most dangerous prey across the continent So much the better for him and worse for hunters! And a very impressive animal, with long horns bent outward before curving upwards then you are in decline, and that at the base are joined on the forehead forming a kind of protective helmet. The African Buffalo is not afraid of no other animal faces and beasts without flinching. It is known that buffaloes have sometimes killed some imprudent lion who had tried to attack them. Despite its legendary strength and aggression, the African buffalo love peace and wants nothing more than to be at peace potersene. It is a social animal and lives in herds more or less numerous, which can be formed by a single family or a grouping of several tens or even hundreds of heads. Each pack is led by an adult female and an expert and not as a male, as you might expect. The young males living in the herd, but, as they age, they are overtaken by younger individuals and strong, they end up then to retire to a solitary life and become really very shrewish. 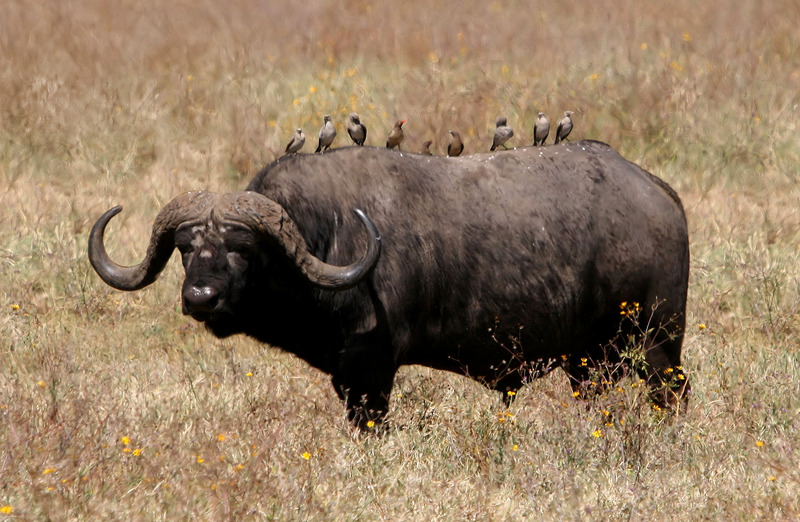 The African Buffalo is active at dawn and dusk. In the hot hours of the day lies down to sleep in the shade and ruminate. He lives in the wooded savannah according preferably near water because it has to drink one or two times a day. When frightened intruders charge blindly, without trying to understand whether it is friends or enemies.